Upon reviewing the service manual, I note that the brake pistons are aligned such that the large pistons sit opposite each other, with the small pistons doing the same. Would this not create unequal pressure on the pad? 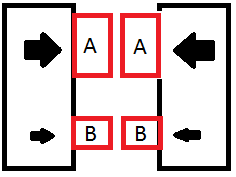 In the above diagram, would pistons A not have more pressure to give the pad than the smaller pistons B? Not so much a technical issue, but rather it got me wondering the above. The purpose of the staggered piston design is to improve the evenness of pad wear. As the brake is applied the leading edge of the pad will remain cooler than the trailing part of the pad as friction is created. To maintain even friction at the higher temperature, more pressure must be applied, so the trailing piston is larger in diameter. This allows a pressure differential between the leading and trailing edge of the caliper, thus providing an even wear pattern along the entire length of the brake pad, hence it controls brake taper. Now that you mention it, that actually makes a lot of sense!